In Göinge region (the district of north-eastern Skåne), including Hässleholm, there are a lot to discover for most ages and interests. You´ll find calm, peace and relaxation here but also exciting experiences. You are close to beautiful hiking areas with trails in varied nature, bathing lakes and good fishing opportunities. This region has a rich culture heritage with plenty of interesting tourist sites such as castles, churches, fortifications and ancient monuments. In the countryside there are a lot of hideaways and favourite spots with nice farm shops, museums, galleries and much more! Welcome! 40 furniture factories in Bjärnum. Today there are a few furniture stores left. At Bjärnum’s museum you can follow the history of the village regarding timber trade and furniture industry. Admire the collection of carved wooden figures or the unique chairs made out of 34 different kind of wood. Among all 300 000 objects at this provincial museum there is something for everyone. The park just outside invites you for a nice walk to the Bjärlången lake. In the park during summer there are music evenings, Midsummer celebrations etc. Outside Mala you can see the stones of Mala , a graveyard originating from the later part of the Iron Age. The graveyard is located on a hill with oak trees and has six stone ships, a stone grave, round in outline, and around 40 standing stones. Bjärlången is one of three lakes with lovely bathing sites in the area of Bjärnum. At Bjärlången there are docks, a diving tower and places for barbeque. At Möllerödssjön lake and Dalsjön lake there are bathing places with docks as well. Close to the lakes there are nice walking paths in beautiful beech forest. In the recreation area at Möllerödsjön lake there is also an illuminated sports trail. For swimming indoors there is a popular indoor swimming pool with a special compartment for the smallest ones in the family. The village has a well-known folk park where, during Sundays, you are invited to dance. Another traditional and popular element in the village is Bjärnumskarnevalen (the carnival of Bjärnum) that during a couple of days in the month of August offers festivities and activities for the whole family. The Musikteaterskolan (the school of music and theatre) in Bjärnum has educated artists for more than 30 years and attracts students from the whole Nordic area. The interest for theatre and music is large and the village has its own revue. Each year Casinogänget presents their popular show at Hässleholm Kulturhus (Hässleholm Cultural Centre). Hästveda, north of Hässleholm, has a long history but it was only when the village got a railway station in the middle of the 19th century that the village grew substantially. You can easily go to Hästveda with Pågatågen trains. In Hästveda you will find calm and peacefulness and also beautiful nature experiences. The Lursjön lake and Hästveda fair are attractions that yearly attract thousands of visitors to the area. The fair, with roots in the second half of the 19th century, takes place yearly a couple of days in the middle of July. The livestock market during Thursday morning is a popular element. The Lursjön lake is one of Skåne’s cleanest and best lakes for bathing. The bathing site is child friendly with a nice beach, docks, diving tower, playground and a restaurant. The camping site next to the bathing place offers possibilities to stay overnight in the middle of the nature. Foresty hills, large meadows and clean lakes are easily accessible for both cyclists and hikers that want to swim, go fishing, hike or pick berries and mushrooms. 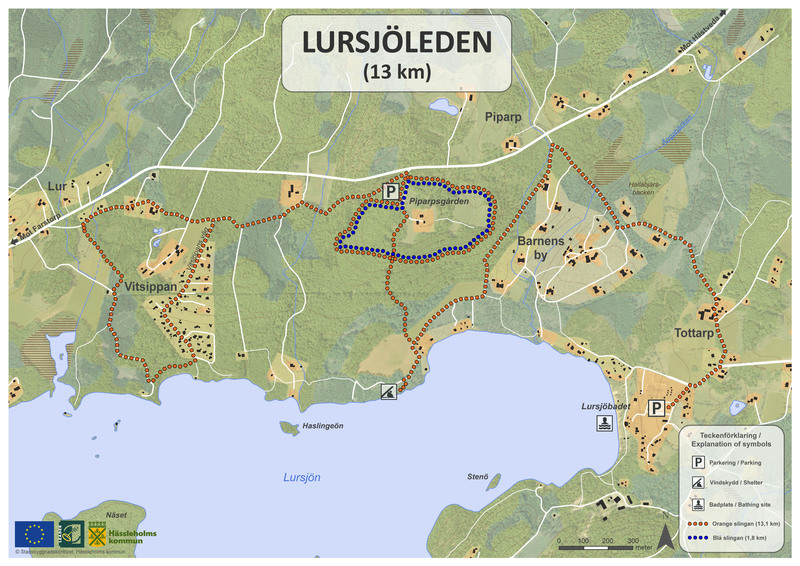 The trail Lursjöleden , 13 km, passes close to the lake and has a beautifully located picnic spot with a windbreak. Around Lillasjön lake, located in the centre of the village, there are possibilities for a nice walk at the three kilometres long illuminated path. Hästveda church , originating from the 12th century, has beautiful church paintings to view for those who are interested. In the beautiful folk park, with a hostel housed in buildings from the 18th century, there are arranged audience friendly events during summer such as music evenings and midsummer celebrations. In one of the buildings there is a smaller exhibition where you can see Sonja Stjärnquist’s stage dresses. Sonja Stjärnquist was the star of the region and a great singer and actress at the time. Sösdala, furthest South in the municipality, was created in the end of the 19th century when the railway from Malmö was expanded north and the community can today be reached with Pågatågen. The station house is still there and is the only one in Sweden left with its original appearance. For a long time, the village has been known for its furniture manufacturing. One of the most famous companies in Sösdala is Dux where among others the famous designer Bruno Matsson’s chairs are made. In the centre of the village the castle Vannaröd is located, which was built during the end of the 19th century by the baron Christian Barnekow. When Christian was married with the Scottish Agnes Sofia Montgomery, he built the castle as copy of his wife’s parental home. The castle is today a restaurant and a room for festivities. With start at Vannaröd’s castle park there is a three kilometres long illuminated trail. Close to the castle the indoor swimming pool is located consisting of a 25 meter pool and a smaller playing pool. The lake Bosarpssjön and Lillsjödal area offer lovely outdoor activities. Fishing and hiking are popular activities and during really cold winters the lake is suitable for ice skating. Summertime at Bosarpssjön lake there is a dock, miniature golf and a small café. The Skåneleden trail winds through Sösdala. The trail passes Vannaröd’s castle and continues to Lillsjödal where you can stay overnight in a windbreak. From there you can follow the trail towards Hässleholm and Hovdala Hiking Centre through a landscape rich with history. In the nature reserve Maglö ekar (Maglö Oaks) around 40 giant oaks decorates the hilly landscape. Here you can enjoy the beautiful surroundings accompanied by the knocking of the Eurasian wryneck. In the outskirt of the village you will find Vannaröds Ängskrona (Vannaröd’s nature reserve) with an abundance of the lesser butterfly orchid that blooms in June-July. For those interested in culture and history there is much to discover in Sösdala. In Esplanaden, in the middle of the village, there is a statue in memorial of Otto Lindblad, also called” the father of student songs”. In Norra Mellby you will find the folk museum Holegården with among other things a multitude of tools from past times. South of Sösdala there is Vätteryd’s grave field which is Skåne’s largest and most intact grave field from the Iron Age with 15 ship formed stone circles. Today there are around 375 stones left, but during the 19th century there were supposedly more than 600. The volcanoes are an exciting part of Sösdala. There are around 200 remains of volcanoes in the middle parts of Skåne and around 50 of them are located in the area of Häglinge. The largest volcano is called Lönnebjär. In the outskirt of the village, during the 1920’s, the so called “Sösdala findings” with high quality of craftsmanship were found. The findings consists of fittings and silver rings from bridles and saddles, and are proof of the fact that people from Skåne have had connection with people from the continent as early as the 5th century. It is believed that mercenaries from Skåne fought with the Huns. The findings will be showed at Historiska Muséet (the historical museum) in Lun d during autumn 2018. The Sösdala day is a popular event in the village as well as the shows by the revue association. During several years the Sösdala tour has been arranged with possibilities for visiting and activities at some craftsmen’s workshops and businesses, in the area of Sösdala. In Tyringe, west of Hässleholm, you will find peace and calm at the same time as the trains Pågatågen offer closeness to Hässleholm city. The village became in the beginning of last century known as a popular health resort, where people travelled for recreation and for drinking the healing water in the famous radium fountain. The fountain has a crystal clear water and is even today worth a visit. The creation of Tyringe sanatorium and the bathing facilities as well as several hotels, pensions and resting homes together with the metal industry started the development of the village. In the area there are several attractive recreation areas. At Stenberget you will experience beautiful beech forest and dramatic height differences with a nice view over Finjasjön lake. In Sanatorieskogen (sanatorium forest) there are kilometres of lovely walking paths and tracks for those who would like to run. During winter there are tracks for skiing. Not far from Tyringe you will find Hovdala Hiking Centre with several nice hiking trails for short walks and half day tours as well as hiking adventures for several days. In connection with the trails there are plenty of famous tourist sites such as Hovdala castle and Hovdala Treehouse. Tyr’s Hov located in the middle of the village is a true activity paradise with an indoor ice rink, indoor swimming pool, bowling and gym. Five kilometres southeast from Tyringe we find the much appreciated 18 holes golf course of Skyrup . Mölleröd’s castle ruin, north of Finjasjö lake, with ancestry from the 16th century has a short but exciting history. King Christian IV often visited Mölleröd and the castle, before the Danish burned it down in 1678. Other sites for those who are interested in history are Lilla Tockarp folk museum, Tyringe museum and Grydebjär grave field . Not far from Tyringe you will find Finja church which probably is built around year 1130 and is one of the oldest churches in Göinge area, with among others chalk paintings. Yearly events in the village is Tyringedagarna (the Tyringe days) and the Wrambjers family’s popular summer concerts with sing along in Åparken in the middle of the village. In Vinslöv, east of Hässleholm, you will find peace and calm. At the same time there are good connections with Hässleholm city. The village can be reached with Pågatågen as well as with Öresundstågen. The Hedbergshuset (the Hedberg’s house) in Vinslöv was during many years known for its furniture shop. Today Vinslöv’s art association has recurrent exhibitions here. The famous movie “Plötsligt i Vinslöv” ("Suddenly in Vinslöv") has placed Vinslöv on the map by, among others, Holger and Anders who share their everyday life with miniature golf, art exhibitions and parrots. For those who would like to play golf in Vinslöv there are courses both outside and inside. Nature is accessible for those who want to hike, bicycle and to pick berries or mushrooms. The Vinslövsjön lake is located in the outskirt of the village. Here you can fish all year round and go ice skating during really cold winters. Around the lake there is an illuminated walking path on 3 km with beautiful surroundings. During warm summer days you can visit the popular outdoor swimming pool for both playtime and sport. Nearby there are possibilities for staying overnight at Vinslöv’s camping. The nature reserve Åraslöv’s bog , east of Vinslöv, offers an easy hike on paths with footbridges through broadleaved forests and ground rich in orchids. This place will satisfy both the casual nature lover as well as the bird watcher and the botanist. As many as thirteen orchid species grow here and the area has a rich bird life. Vinslöv has a long history and for those who are interested in culture there is the folk park in the village and a beautiful church in Gumlösa, which is well worth a visit. The church originates from year 1192 and is the oldest dated brick church in the Nordics. East of the village you will find the grave field Stainabjär where the stories tell of King Olof Skötkonung’s son Anund Jacob that suffered a defeat against the Danish king Knut year 1027. Yearly events in Vinslöv are the village fair in June and Vinslövdagarna (Vinslöv’s days) in September. Vittsjö is beautifully located north of Hässleholm. Here you will find calm and peace while Pågatågen trains offer good communications with Hässleholm city. The forest and the many lakes are the reasons for the healthy air that during many years has attracted tourists as well as the local inhabitants to the area. Vittsjö is the municipality’s oldest and most famous health resort where people, since the 19th century, have travelled to rest both body and soul. During its glory days there were as many as 14 well visited pensions in the area. Vittsjö offer many nature-, culture- and spare time activities all year round. The forest offers berry and mushroom picking and there are possibilities for pleasant walks and hiking tours along the Skåneleden trail , Vieåleden trail and in Ubbalt’s nature reserve . The trails pass through beautiful beech forests, partly pass alongside water and offer a landscape rich in history with several interesting sites of culture heritage. An example is the remains of the castle Skeingeborg , originating from the Middle Ages and known for its octagonal wall, that can be found along the Vieåleden trail. The lakes in Vittsjö offer endless possibilities for outdoor activities, summer and winter. Fishing, water skiing, ice skating and swimming are some of all activities you can do, and personal favourite hideaways are never hard to find. For those who like golf, there is a popular 18-hole course with a restaurant, east of the village. The municipality’s women’s team in Swedish soccer, Vittsjö GIK, has its home arena in the “Västanskogen” in the outskirt of the village.